On my design wall is an I-SPY QUILT I started for our new grandson this past Fall. I need about 75 more squares as I want to have five rows on each side of the heart. I was too distracted to even think of cutting any new 4 inch squares. My oldest daughter and I did have fun discussing what backing to use and sorting through scraps in search of more squares. (With no help from this little guy as you can see! LOL!) BTW: She settled on using a red minky fabric for the backing of the quilt...oh how cuddly, soft that will be for this little cuddle bug of ours! Don't you just love happy babies. His parents are naturals! I can't wait to get sewing on this quilt...I miss them already. The quilt really inspires me to make something scrappy for V-day this year. It's our 20th Vday together. But that baby laughing!! I can just hear the chortles! That's the happiest picture I could have seen on this gray day of sleet. YAH!!! I'm so glad his smile made your day!!!! Your love shows through in this post... and this WIP! A red minky will highlight the heart perfectly. Thank you so much for sharing those beautiful pictures of your grandson. He's growing so big! What a handsome smile! Quite the charmer! I love the heart in the middle. He'll treasure this quilt from his Grandma Val for ever. Thanks! And I think the red minky backing will really accent the heart!!! 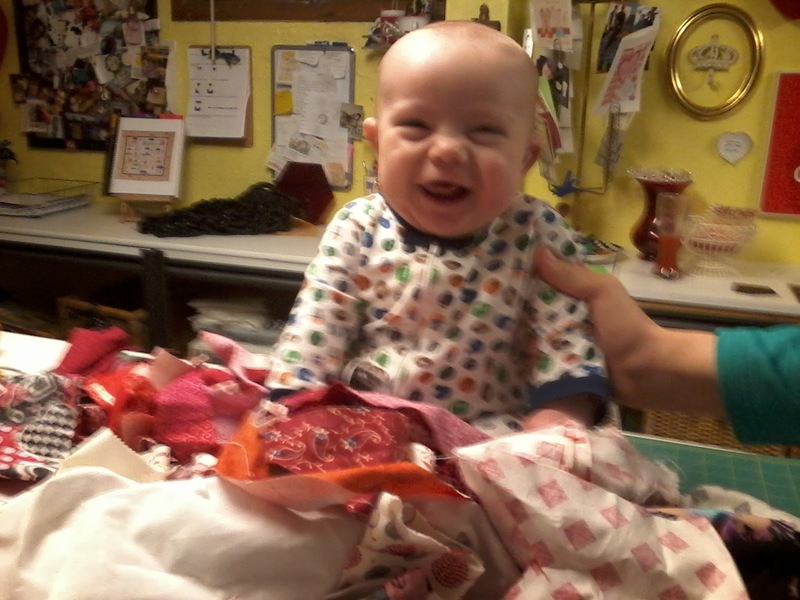 Nothing better than a laughing, happy baby - he's adorable. The quilt is going to be so special...you know he's going to love it forever, Grandma...Happy Wednesday - happy sewing! I'm taking extra care on the seams to make them a good 1/4 inch...so it can stand being dragged around! That little guy is adorable and i can see his quilt will be right down his alley. I can't wait to see the finish. My daughter and son in law are already talking about how they'll use it ALL the time!!! LOVE THAT!!! The eye spy quilt is great but the grandbaby steals the show! Notice his picture is the biggest...LOL!!! Love your quilt - such a cute recipient! I'll look through my I Spy collection and send you some squares - send me your snail mail address. Woot Woo!!! THANKS Terri!!!! I'll email ya! What a fabulous quilt. I love how the heart is growing! Mother and baby just seem to glow in that picture. Very special. What size are your "blocks"? My blocks are all cut 4 inch square. THANKS Terri!!!! I love it! I did a little eye spy on the quilt myself. Your little guy is just so cute! They are so fun to sew for. Thanks for your help Dona! Oh Val..what a happy grand son! Your I-Spy is coming along beautifully. Love the idea of an eye-spy quilt. Guess I had better start now collecting squares as I can see it takes a lot. CUTE. CUTE. CUTE. Both the quilt and the sweet little one !! I think the red heart in the middle is genius! I agree with Three Sheep Studio's comment about the reason they call them GRAND babies! They are the best. Will be such a fun quilt! Love it. I have about twenty more squares cut for you :-) they'll be on their way soon! 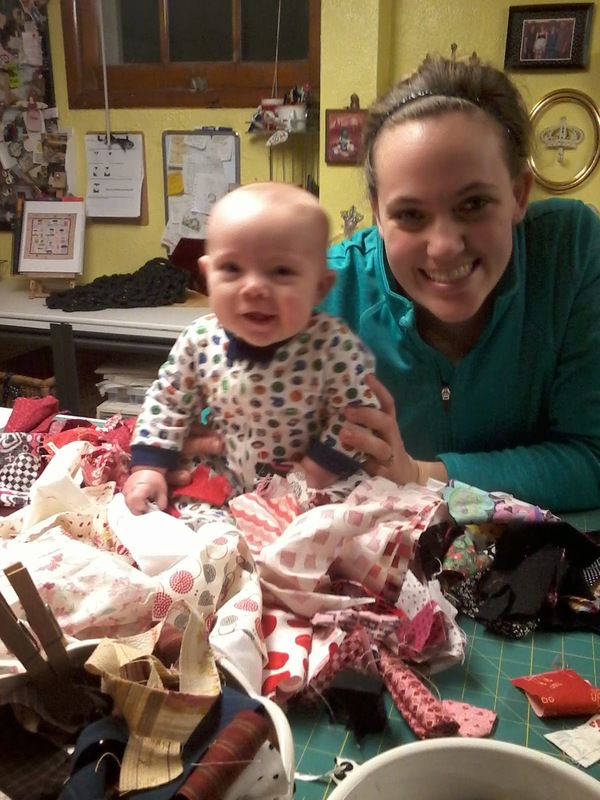 Babies and quilting is a WONDERFUL thing!! and Sharing it across 3 generations! Love the I-Spy. Have yet to see one like yours! That is going to be so adorable! Even we Grownups would have fun looking at it! I hope to make an I spy quilt SOME day! The heart in the center is very cute! aw! what a sweet smile! I know you love cuddling with him, and I know he will love that quilt one day when he's old enough! ...and the minky back will be perfect! Good pick! I love how you added the heart into your quilt. He looks so happy as does your daughter. Way to go Grandma Val! I can't wait to see it complete.